Fossil BRAND Iconic Metal Necklace Lock Silvertone Eternity Link Rtl. 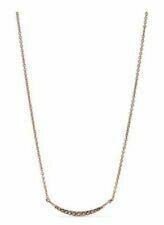 Fossil Women's Necklace. Great condition. One silver tone and one gold tone. Both marked Fossil. Both are marked Fossil. Silver chain with four charms that drop about 2.5”. This charm is removable from the chain. Charms are: pearlized “O”, small silver “O”, oblong with very small stones (one is missing) and white bead. FOSSIL NECKLACE - BEADED MULTI COLORED. Condition is Pre-owned. Shipped with USPS First Class Package. Fossil Brand Necklaces (3) and (1) Bracelet. Silver and rhinestone rose pendent, antique bronze and multi color rhinestone frog pendent, antique bronze, black and rhinestones binocular pendent and bracelet is leather with silver and rhinestone charm. Excellent condition. Condition is Pre-owned. Shipped with USPS First Class Package. We want you to receive a product that you are excited about! We appreciate your diligence in this regard! Our hours of operation are M-F 9am to 4pm. Main stone: Ammmonite Fossil(Natural). 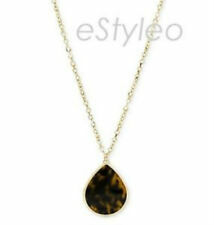 Style : Dreamlined Fashion Jewelry Silver Necklace Pendant. Material: Fashion Silver plated. Quantity: 1 pcs. This is a good thing as you want a genuine real Baby Moroccan Orthoceras Fossil Crystal. It has a long conical shape. Like the ammonite it is a cephalopod. by ZENERGY GEMS™ ". not a perfect, blemish free FAKE. This item is a silver heart and key chain link necklace. Fossil Black Leather Cord Necklace w/ Flower Pendant. Adjustable from 18" to 20" long and 1 3/4" Pendant. 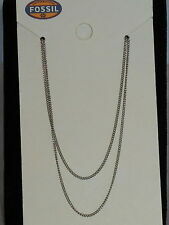 Ultra LONG Fossil Brand Necklace NWT Chic And Sophisticated Jewelry. Condition is New with tags. Shipped with USPS First Class Package. Fossil necklace. 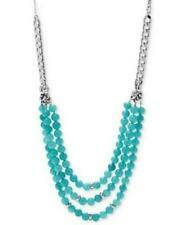 Silver chain with turquoise beads. 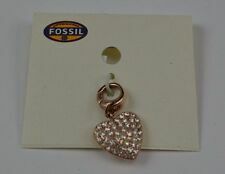 Like new condition Fossil brand heart necklace. Heart is 1 3/4 inches high,1 7/8 inches wide and 3/8 inches thick. The chain is 24 inches long. The heart has a flower and butterfly design, with rhinestones on the loop the chain goes through. There is an open keyhole design on the front of the heart. Includes original Fossil tin box. Fossil Silver Multi Color Rhinestone Pendant Necklace. In excellent condition. 18 inches. Stainless steel necklace with a quirky chain and stylish chunky central pendant. 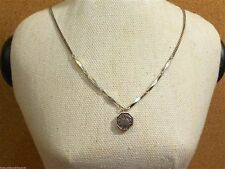 Fossil Brand Silver Lock Clasp Long Necklace 37.5"
The clasp has a turn-lock that works. 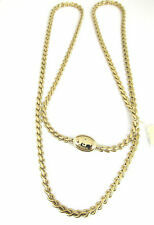 Fossil Brand Chain Necklace 18"
Fossil Toaster Charm Silver Colored Gold Colored Toast Stainless Steel. Measures about 1 1/2 inches with clasp. Toast leaver is movable and toast pops up and down. Condition is Pre-owned. Items can be combined with invoice requested. It has a gold chain, and light pink and grey stones. You are buying aFossil Butterfly Pendant Necklace. Very good condition. This beautiful necklace has is gold tone. This has three strands: one with white beads, one with light pink beads and one with small crystals.This will be the perfect accessory to so many different outfits. Fossil necklace - 18"-20" long (adjustable). Silver flowers and three beads. Fossil Bracelet Faux Turquoise Blue Gold Toned Abalone Butterfly Bee. Approximately 8 1/2 inches. Condition is Pre-owned. Dispatched with USPS First Class Package. Signed "Fossil". Heart lock and tiny key pendants. Standard clasp. 17" Long chain. Pendant is 2" x 1-1/2" - Chain is 20" (18" 2"extender). Extender has Fossil iconic 3 pc charms at the end. Beautiful Glitzy crystal bird wing dangles from chain and appears to be in flight. You may receive one that has slight surface imperfections. This is a good thing as you want a genuine real Baby Moroccan Orthoceras Fossil Crystal. It has a long conical shape. Like the ammonite it is a cephalopod. Blue Purple Green Yellow Pink. Crystal Ball Pendant. Signed Necklace. I tried to make as high quality picture as possible. Bumble Bee Pendant Necklace with small light green stone. Great condition! Locket has blue and clear stones. 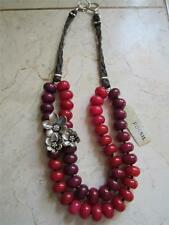 Can be worn long or as short 14 1/2" necklace. Also has small round silver of dark stones on chain and on one side has oval piece that says Fossil and a keyhole opening. If you like their belts and accessories, you will love the jewelry. This great necklace features a fine goldtone stainless steel chain with a champagne Pave' square pendant and classic lobster claw closure.